The structure and variability of the upper atmospheres of the giant planets may be investigated by occultation techniques . Ground-based photometric monitoring of stellar occultations measure the attenuation of starlight by the planet’s intervening atmosphere due to differential refraction. This requires a sufficiently bright star to act as source and such opportunities are not frequent. A recent example was the occultation of the bright star 45 Capricornii (45 Cap) by the planet Jupiter on the night of 3-4 August, 2009. On April 12, 2016 the planet Jupiter will occult the bright star HIP 54057 (K0, V=7.25) as viewed from areas of Europe, Africa and Asia. The occultation will sample similar planetographic latitudes at Jupiter as the 45 Cap event in 2009, allowing direct comparisons of the planet’s atmospheric state between the two epochs. The event has an added significance in view of the expected arrival of the Juno spacecraft to the Jovian system. 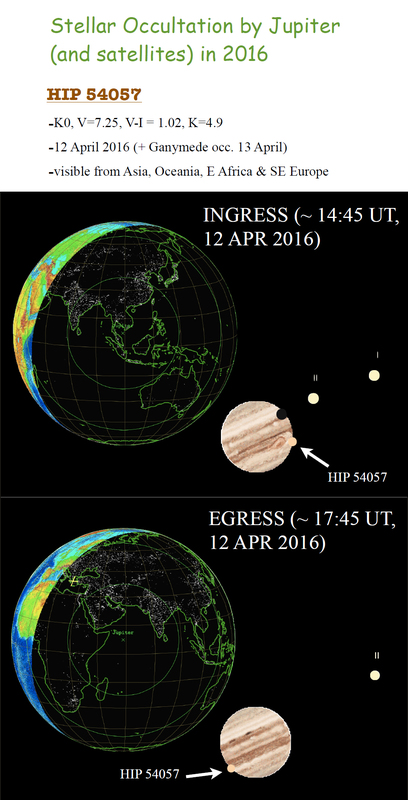 For European observers, ingress occurs during daytime while egress takes place at approx 1745 UT when the sun is below the horizon from E & SE Europe. Due to the star being a K dwarf (V-I=1.02), use of a broadband R or I filter (a narrowband filter may be used with large aperture instruments) is recommended to suppress the twilight sky signal and increase the contrast between the limb of Jupiter and the star. Following this event, the star is occulted by the Galilean satellite Ganymede (V=5.3) as viewed from certain (tbd) areas of E Asia and the Pacific at approximately 1200 UT the next day, April 13. This secondary event may be useful in refining the ephemeris of the satellite and to constrain the existence of a tenuous atmosphere around it. Dense photometric observations are requested during ingress and egress. A visual summary of the event is provided in the following image (see also ref ) prepared by Apostolos Christou. An optical summary of the observing conditions of the occultation of HIP 54057 by Jupiter (Credit: A. Christou).